"Hamas is ISIS" meme tweeted by Israeli Prime Minister Benjamin Netanyahu. In late July while Israel’s 50-day offensive Operation Protective Edge was in its final weeks, Prime Minister Benjamin Netanyahu’s right-hand man met with a group of journalists in Jerusalem. Tensions were at a peak; the ground invasion had just ended and the air campaign was at an unstable pause. The Israeli Minister of Intelligence Yuval Steinitz was about to give the first political strategy briefing on what the Jewish state would want for the future of Gaza, what it would go on to lobby for in truce talks once reconvened in Cairo. Meanwhile in another part of the Middle East, ISIS carried out its first public decapitations that grabbed Western headlines– they killed over 50 Syrian soldiers and mounted their heads in a town square. Gaza and Israel were overshadowed by the Islamic group that had declared a new caliphate. Back in Jerusalem on that July afternoon the Steinitz made the case for the de-militarization of Gaza and to strategically turn the besieged coastal strip “into Ramallah.” It would have been a blockbuster announcement, if not for ISIS. For years the Israeli-Palestinian conflict had centered around the status of the West Bank, but over the summer it became clear that Gaza was going to dictate the future of Israeli-Palestinian relations, and either shore up or break Palestinian national unity. Steinitz continued that weapons were still in the hands of Hamas, the root of the current strife, and removing those weapons was a “precondition for any serious relief” to the Gaza Strip. “You cancel the terror threat, the rocket threat from Gaza on Israeli citizens and you can cancel the restrictions so the so-called siege on Gaza,” he said. Steinitz debuted the Israeli government’s most powerful argument for de-legitimization of Hamas: the ISIS comparison. Breaking News“It’s the same organization and it’s the same aim,” said Steinitz. He then turned the platform over to another Israeli government official to present a PowerPoint presentation of “a short comparison between Hamas and other Sunni Islamic terrorist organization,” noting, “It is one family of different organizations.” Then, fumbles over technical difficulties and swallowed laughter from the foreign press corps as the purpose for this meeting became clear: the West v. ISIS. “The final goals are similar, to make an Islamic hegemony, not just in Israel, Iraq or Syria. But all over the world,” said Steinitz as the lights lowered and the slides were cued up. Yet as Jonathan Cook reviewed earlier this month, Hamas does not, never has, and likely never will call for Islamic hegemony. Christian Palestinians who live in Gaza endure the same life quality as their Muslim counterparts under the authoritarian and elected government of Hamas. There was no great purge of Christians—as ISIS is carrying out—when Hamas came to power in 2006, and no Christians have ever been asked to pay jiziya, a special tax dating to the Ottoman era where non-Muslims would be taxed in order to be exempt from military duty– a tax ISIS briefly implemented. If Christian Palestinians chose to do so, they can even fight in Hamas’s armed wing. In short, they have the same status as Muslim Palestinians. And it has to be stated that whatever torment Hamas has inflicted by policing the Palestinians in Gaza with an iron fist, it pales in comparison to the broad scale poverty inflicted by eight years of siege and erasure of entire towns during Protective Edge. An opening image in the PowerPoint displayed Hamas’s political bureau leader Khaled Meshal with a child of no more than five years wearing a green Hamas headband, with green flags. The adjacent image was of a child decorated in the black flag used by all Salafi Islamic groups, including ISIS. But in the Palestinian context, there is no love for ISIS. Though local Salafi group called Hizb-ut-Tahrir has sported the black flag for the past decade when calling for the return of the caliphate, Hizb-ut Tharir’s dissidence is aimed at the Palestinian Authority. One protest was held outside of an equal opportunity job office, another called for unity between Hamas and Fatah. And last spring they raised their flags against America, chanting “No, no Obama!”—and as I photographed the event the Palestinian protesters kindly greeted me explaining they like the American people, just not the government. It was clear then, as now, that Palestinian groups, even Salafis, are more concerned with the policies that dictate their lives under Israeli occupation than the esoteric call for a global caliphate. Moreover, Hamas and the Palestinian Authority have both cracked down on Salafi groups as they represent a row over domestic power. Even in its contradictory statements on establishing a state, Hamas has never advocated for boundaries beyond the June 1967 lines, or in all of historic Palestine (occupied Palestinian territory and Israel minus the Golan). They do retain leverage in negotiations with Israel by not recognizing Israel, but that’s a far cry from wanting to take over the world. Hamas also has an “open door” policy of meeting with Western diplomats, as noted by Cata Charrett in her researched backgrounder on the group. Within days of Minister Steinitz’s resounding pound against Hamas as comparable to the most violent Sunni Islamist group to date, Netanyahu parroted his remarks, calling Hamas and ISIS both “branches of the same poison tree.” From then on, ISIS and Hamas were echoed as evil equals. When US congressmen Elliot Engel and Ed Royce visited Netanyahu at the beginning of September, Netanyahu told them, “We’re fighting not just Israel’s war, but I think a common battle against enemies of mankind – Hamas, Hezbollah, al-Qaeda, ISIS.” In turn the Engel said, “we in the United States in a bipartisan way certainly agree with that assessment,” promising to lobby the U.S. foreign affairs committee on behalf of Israel. Over the past few days, the issue of the similarities between the Hamas and ISIS terrorist organizations has been in the headlines. 1. Both terrorist organizations share a global expansionist worldview which aspires to establish a caliphate: a Muslim regime ruled by Sharia (religious Muslim laws). 2. Both organizations are extensions of global movements of radical Islam: Hamas is an extension of the Muslim Brotherhood while ISIS is an offshoot of al-Qaeda. 1. Both terrorist organizations view jihad (holy war) and suicide attacks as primary tools for obtaining their goals. The meaning of the name Hamas is “the Islamic Resistance Movement” (the term “resistance” is a codeword for terrorism and armed struggle). 2. Both organizations have seized territory by force: Hamas took Gaza in a coup against the Palestinian Authority in 2007 and ISIS has taken control of large parts of Iraq and Syria. 3. Both organizations imposed radical Islamic rule on the territories they captured, through the use of armed force and violence devoid of any red lines. 4. Both organizations have executed defeated opponents: Hamas murdered members of the Fatah Movement’s Force 17 following its takeover of the Gaza Strip in 2007, while ISIS indiscriminately murdered Iraqi and Syrian soldiers after they surrendered. 5. Both organizations terrorize the territories they control through intimidation, threats, executions and efforts to apply the most extreme Sharia laws, including the stoning of women suspected of adultery and the execution of homosexuals. ISIS is already applying these edicts, while Hamas parliament members have prepared legislation in this spirit. 6. Both organizations educate (read: brainwash) children to sanctify death and to die as a martyr (shahid) in jihad. 1. Both terrorist organizations strive to commit genocide against their opponents: Hamas has stated its intention to wipe Israel off the map and inscribed the killing of Jews in its charter, while ISIS commits systematic mass murder of populations in Iraq, including Christians, Yazidis and even fellow Muslims, especially Shiites. 2. Both organizations execute people who are suspected of being close to or supporting their opponents. ISIS executes all those who are suspected of sympathizing with Assad’s regime in Syria or the Iraqi government, while Hamas executes Palestinian opponents as well as anyone suspected of having ties with Israel. Even the executions themselves are similar – a “drum-head court martial” in which masked people violently murder the victim in a public area with the intention of terrorizing the public. From the time of Israel’s first declaration that “Hamas is ISIS” it has concurrently conducted indirect negotiations with Hamas to come to an agreement on Gaza—hardly the treatment due to a radical jihadist group. Meanwhile, on the northern border the United Nations have decamped hundreds of peacekeepers this week as the Syrian strife neared the Golan Heights. Israel may have a scrimmage ahead with ISIS, but ISIS is not Hamas. Speaking about propaganda, Geller gets the thumbs down from De Blasio re her hate ads. I guess Geller is desperately trying to hide the fact that her beloved nation Israel gets the MOST aid from US taxpayers, and that some Islamic nations get aid so that Israel’s borders are kept safe by those nations. Geller is a hate yeller, and represents the zionists quite well here in the US. Did anyone else’s head explode after reading that? yep– good thing i was wearing my helmet. The supremacist “Jewish State” of Israel is an enemy of peace, justice, accountability and equality. Pathetic hasbara from the country that killed 500 children recently. And had citizens chanting that gaza had no more children. RE: “He [Steinitz] then turned the platform over to another Israeli government official to present a PowerPoint presentation of “a short comparison between Hamas and other Sunni Islamic terrorist organization,” . . . “The final goals are similar, to make an Islamic hegemony, not just in Israel, Iraq or Syria. But all over the world,” said Steinitz as the lights lowered and the slides were cued up. • The Goebbels family. In this vintage manipulated image, Goebbels’ stepson Harald Quandt (who was absent due to military duty) was added to the group portrait. 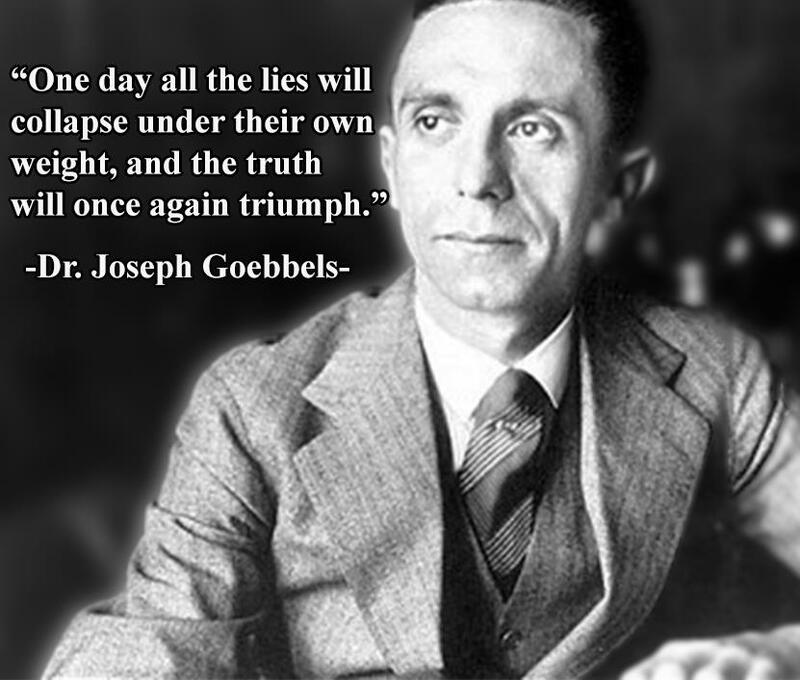 • Dr. Goebbels’ on the appropriate role of the press/media. • Dr. Goebbels’ extremely narcissistic, but incredibly timely prophecy! Yes, that’s pretty much the point I think maybe I was trying to make (however ineptly). 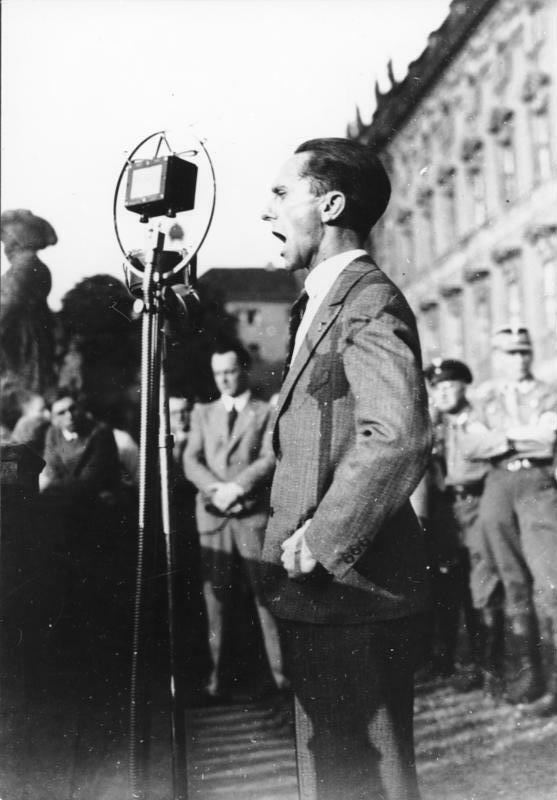 Goebbels is so not relevant. I think he would be amazed at what can actually be sold! A rank amateur, it would seem? Israeli propaganda is never a surprise– it’s entirely predictable and despicably redolent of Islamophobia. Hamas is resistance and bears NO resemblance to ISIS/ISIL… NONE. In the area of the ME that comprises Palestine and Israel, I see only one side that is illegally seizing land, imposing an apartheid rule that values and rewards adherents of Judaism above all, and terrorizes a captive and Occupied population daily through a grotesque variety of measures that are all aimed at their ultimate goal of ethnically cleansing the land of the indigenous people. I could go on, but you probably get my drift. it’s pretty obvious how much less brutal Hamas is for dragging a live man through the street tied to a vehicle then is IS who head chops. >> DaBarkeee: it’s pretty obvious how much less brutal Hamas is for dragging a live man through the street tied to a vehicle then is IS who head chops. They’re pretty much on par with Zio-supremacists who pour gasoline down someone’s throat and then set them on fire to burn alive. “It’s pretty obvious” that zio missiles and drones behead too – my my the f*cking hypocrisy of state terrorists and their terrorism! And don’t forget, there is no difference between ISIS and CAIR according to World Net Daily. Your link states that the “Translation ” and tape are provided by “MEMRI”. Now lets compare the Likud charter, source not in question. @amigo, please spare us the same old obfuscations and distractions. We are not discussing the charter of one of Israel’s political parties but you have to go there – like a moth that is attracted to the light. Not one refutation of my assertions about the bellicose intentions of Hamas – just the usual bluff and off topic hot air that is bread and butter Mondoweiss. huh? you’re being hypocritical. this post was not discussing meshal’s speech on 7 December 2012, but like a moth you went there. and you went there with an an unreliable islamophobic source. the supporting link leads to another article to the same source (itself) and that link leads to http://www.timesofisrael.com/hamas-chiefs-gaza-visit-sign-of-regional-embrace/ which doesn’t make the same allegations. the video it presents is from memri, known for their lying translations. and we’re supposed to take you seriously? you don’t think msm covered this? you provide memri? take a hike w/your divert divert divert! so it is you, here who ignores amigos comment, whatever refutes your line of argument. it is you who overlooks key parts of the Likud charter! we’re not your fools. practice what you preach. algemeiner or frontpage mag or atlas shrugs or any of those sites do not cut it here. Lastly unlike yours my comment is right on topic as it exposes the lies that Mondoweiss writers are happy to propagate in defence of their beloved Hamas. President Obama has insisted repeatedly that American military action against the Islamic State depended on the installation of a more inclusive government in Baghdad, but he moved ahead before it was complete. it certainly did divert the news from israel slaughtering palestinians, didn’t it? and you’re linking to clifford may? why not daniel pipes while you’re at it? i’d say in a post about israeli propaganda likud charter is definitely as relevant as your memri crap, which btw, the independent did not support memris full translation. Hamas has bellicose intentions, but for over 60 years the oppressive, colonialist, expansionist and supremacist “Jewish State” of Israel has been stealing, occupying and colonizing Palestinian land and oppressing, torturing and killing Palestinians. The intentions of Hamas do not justify Israel’s very real and ON-GOING (war) crimes. Rubbish. Reporters who were in Gaza, giving first hand accounts, say otherwise. No it doesn’t. It states that the speech “ruled out any territorial concessions over Palestinian territory or recognition of Israel, while also calling for Palestinian national unity.” That has nothing to do with what MEMRI claims. Rubbish. Your obfuscation, hypocrisy and whataboutery came back to bite you and you cried foul when you were exposed as a shill. My powers of sarcasm, satire, and mockery are by no means nugatory, and yet time and time again they fail to match the absurdity of Israel, so that I am reduced to simply gawping in disbelief. I will probably still, from time to time, try, in a desultory, defeated, manner, to make some witty quip, but it will always be with the knowledge that whatever I say will not be equal to the occasion. I know the feeling. How can you make a joke about a joke? RoHa, look, there’s nothing funny about Israel, but there is still a lot of humor to be squeezed out of the way Zionism has turned us into an embittered, entitled aristocracy. From “human dust” to “Ahkenazi +15IQ” in one-and-a-half generations. And the saddest part is that it is looking like even Israel-critical or anti-Zionist folks use the Zionist conception of “the Jews” as a starting-point for thinking about it. I suppose I could drive if I had a fun-house mirror for a rear-view. But replacing the windshield with carnival surplus is not a good idea. I’m gonna go put on my Jewish jeans. your link worked for me antidote, you don’t have to repost it . Its sickening when religious people express hatred and bigotry as religiously sanctioned . This includes Muslims, Buddhists, etc and lately many liberal Christians. case in point, the ignorant ‘christian’ bigot Rod Dreher. Someone should write an analysis of his articles repeatedlu dripping with racial animus and incitement. Israeli propaganda? Just a whiter shade of fail. Yaron, a senior lecturer in sociology at Ashkelon Academic College, emphasizes how important teachers and the principal (and the education system in general) feel it is to stick to the curriculum and the lessons schedule – two islands of quiet amid a risk-laden reality. Did you know that Hamas is still holding the bodies of Israeli soldiers? Heartless,ghouls. Release the thousands of political prisoner and underage Palestinian children you flaccid wannabe victim! Nice to have you back Taxi! Are you referring to the former or the latter???. Oh by the way, did you know Israel trades in dead Palestinian/ Hizbollah resistance fighters. Do a little research Gene before you lunge in head first. Did you not learn that in Law School????. Ok, I thought whataboutyouery is a no- no. So why do you keep doing it? Unlike Israel, who’s bombs turn bodies into pink mist and body parts burried under tonms of rubble. Did you know that Israel trades in the organs of dead Palestinians. Heartless necrophile death cultists. Something absolutely astonishing is going on right now in northern Syria along the Turkish border: refugees streaming on foot across the barbed-wire frontier by the tens of thousands, fleeing the advance of the terrorist army known as the Islamic State. As many as 100,000 refugees, mostly Kurds, have crossed the border in the past week — up to 60,000 on Saturday alone — while ISIS enters and occupies village after village with tanks and heavy artillery. Something absolutely astonishing is going on right now in Palestine along the Egyptian border: refugees streaming on foot across the barbed-wire frontier by the tens of thousands, fleeing the advance of the terrorist army known as the Jewishc State. As many as 100,000 refugees, mostly Moslems, have crossed the border in the past week — up to 60,000 on Saturday alone — while Israel enters and occupies village after village with tanks and heavy artillery. well done, point taken, joer. Reply up thread to GS. You obviously did not read the comments policy. If you had , you would be aware that “whatabout-you-ery ” is not mentioned. Must be the “Supremist” in you. Do you write your own briefs councillor??. You write like Shakespeare in that I need foot notes to understand what you are saying. Hamas offered Israel a 100-year truce in 2008. Worse than Isis? Nonsense. The Jewish State couldn’t stand it when Saddam Hussein ruled Iraq and there were no bombings in Baghdad and no Islamic radicals in the streets. So JS got rid of Saddam ostensibly “to promote peace in the Middle East”, but in actuality it was to promote sectarian hatred and Arab on Arab violence in the region. The Jewish State couldn’t stand it when Assad ruled Syria and etc, etc. So JS is getting rid of Assad etc, etc. Now comes IS (or Da’esh) in the wake of JS cunning! and it was only natural that IS would fill the vacuum of destroyed Iraq, destroyed Syria, and destroyed Libya (to name just a few JS triumphs). Stay tuned as JS caused chaos grows more IS (adding up to WW3 in the words of Pope Francis). But-but, here’s the catch when Zionists have to choose between ISIS, Syria’s AQ-Al-Nusra AND Hezbollah and Iran…they’d rather ISIS and AQ prevail! Oh what the heck, it’s only Americans and Brits who are being beheaded, that’s all! As a matter of fact Israel just helped Al-Nusra in its attempt to open a path into Lebanon by downing a Syrian jet in the Golan Heights that was chasing down these AQ-affiliated terrorists. So ISIS, and Al-Nusra should know they have a new best friend, and I for one, can see they all have a lot of bloodthirst in common! When ISIS gets through slaughtering in Iraq and Syria and starts marching into Jordan I hope Oren pays them a visit on the border and gets a taste of their hospitality. Lemme put it this way, ISIS, can do more damage with a knife and conventional weaponry, than Iran would ever do with a nuclear arm. Selfish, apathetic AND stupid describes the Israeli mentality. BTW, “Boko Haram” means “not of this world” or “far from these worldly things”. Something like that.